I check her weibo all the time hoping for any baby news and she gave us this, i guess it's business as usual for her ..and as @leeza77 puts it, new and exciting endeavours to come, wish her all the best!! she hasn't been idle when waiting for the birth of her child.. Well, active mom, smooth labour. Awaiting official announcement, as always. Hopefully her next drama would be the police drama that she said she wants. I dont think she have ever tried serious suspense drama yet. Honestly I find her modern drama (excluding shan-shan) to be lackluster, nothing against yingbao, but it’s rare for me to like modern chinese drama. I am glad she found a new team to manage her. Hopefully this means that she plans to return sooner than people were expecting. Probably in 1-2 years. XieNa and Angelababy went back to work the same year so I don't doubt that ZLY will probably not take super long to come back. But I am also happy that she and FSF are both taking time off to enjoy their family. They have plenty of money so they should enjoy it. Am i being selfish if i want her to return sooner.. Miss her. I keep imagine that when she is shooting fsf will be with her and took care of the child. So that zly will not miss their child. Then they change roles when fsf turn to shoot. Congrats. Their son is born today. 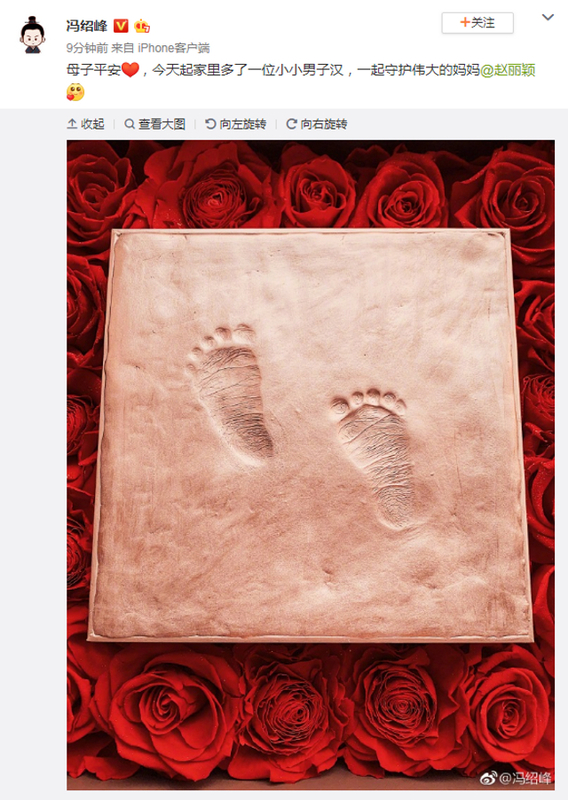 Feng shao feng just posted the baby footprints on his weibo. Congrats to our Yingbao and FSF for the arrival of their baby boy!..finally she gets to see how her baby looks (i've read that somewhere). Ohh...finally,congratulations to our lovely couple and welcome to the world little angel ,,hope they also show us his face hihi...Im so happy for them .. I posted this at the otp thread and reposting here. On a personal note, I've had a miscarriage and I don't know if ZLY ever had one but I know that after such an experience you are less likely to want your pregnancy to be known. At least that was the way for me and I understand her. Before a celebrity she is a human being. I think people who haven't experienced this stuff dont understand and there seems to be a taboo about women speaking of stuff like this. Yes, it's true, i remember now, someone did say that she was 3 months along at the time (July/August) so obviously she would've denied that but then again the way the papz or the media were like wolves hounding on her and already shared the public her 'secrets' why should she please them by confirming anything? I would hate it too if someone tells out my secret, i will say it if or when i'm ready.. We all know she's very protective and want to make sure her family stayed low-key. She's THE popular actress at this time so we should only know her as an actress and watch her works no need to go stalk on her family. I'm pretty sure we will not be seeing her baby either unless it's the back of his head or all covered up. So sorry about your personal experience and i hope this didn't or will not deter u from having more children...but on a happy note, Liying is a first time mommy! I've read there will be a remake of Boss and Me but in Thai version, filming will start next month..wonder if the actress will be as cute as LiYing? i hope i will get to see it when it's out.